Denim on denim is one of my favorite and easy looks to put together. A lot of people feel iffy about that combo but I just love it. I love it even more especially when there's a nice contrasting color. 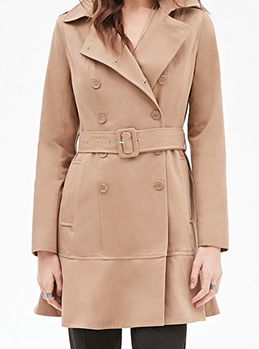 I wore it with my camel coat, which has been such a big trend. It seems everywhere you look even celebrities are rocking long camel coats. This one was inexpensive from Forever21. I added a few accessories to chic up this look. 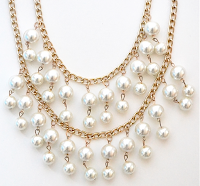 Let's start off with this cute pearl statement necklace. I came accross this cute online shop that has the cutest accessories; it's called Shamelessly Sparkle. I was in accessory heaven on their site! Let's just say I might go back a get a few more necklaces because I'm a big statement necklace girl. The necklace added the perfect finishing touches to the look. I, also, added a leopard clutch into the mix for a little print action. Lastly, I added these blue aviator sunnies that I borrowed from my moms kloset! (thanks mom) One of the benefits of having a young mom that has the same taste as you as that you get to borrow cute stuff. Haha! Thank God that tomorrow is Friday! Have a fab weekend guys! Such a great look with the camel coat and such a perfect choice of accessories!